www.barcelonafotoantic.com is the personal and solidarity project of Mercedes & Mónica Miquel Abella, to make known their father’s photo collection. Through the snapshots of Joan Miquel-Quintilla, keen amateur photographer, remain forever the feelings and lives of the people at that time and they are a graphic manifesto of an era. 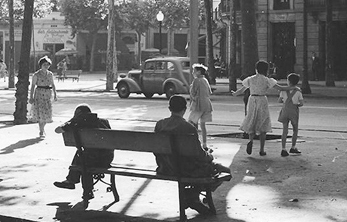 These pictures are a look back at our past, a further testimony of what were the years from Spanish Civil War till the advent of Democracy. Our father, as scientist, was engaged in medical research to rise the quality of life of the people, following this line of thought the project was born. The purpose of www.barcelonafotoantic.com is to provide funding for helping biomedical research projects, that we are hoping to achieve thanks to the solidarity of whose interested in these pictures. Under the transference “concept” must appear the benefactor’s name including the word “ BARCELONAFOTOANTIC. The donation certificate can be requested via e-mail to ObraSocial@solidaridadsjd.org with the copy of the receipt and the tax data attached. www.barcelonafotoantic.com is a entirely self-financing Project and brougth forward by Mercedes & Mónica Miquel Abella without any form of grants or sponsors neither for the snapshots digitalisation or the creation and maintenance of the web page.